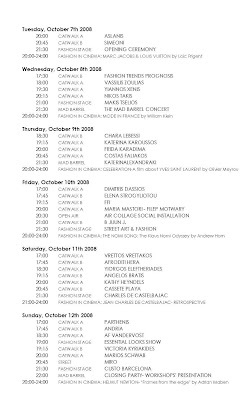 I managed to get hold of the schedule and venue map, so click on the images to see: For more information, the so-called official fashion week site is here, but I wouldn't recommend it as it seems to be more of the production company's website that the actual fashion week one. 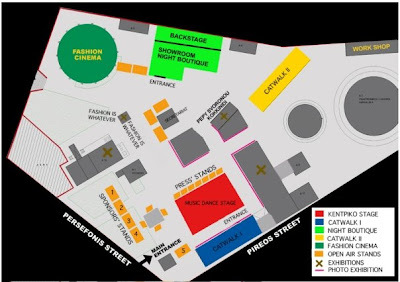 If you are on Facebook check out the Athens Fashion Week fan page. This actually has some pictures that might be helpful (it's where I got the map from). Those who speak greek can get their fix on ALL the info concerning Athens Fashion Week on the official City of Athens website here. For those interested in EVEN MORE information, I already asked the PR company that represents Athens Fashion Week to send me the press release in english and they kindly obliged. The actual press release is too long to publish it here, but whoever is interested, leave me a message and I can forward it to you. Wow, Lopi, you really did your homework! Will you get to attend any of the shows, I hope? I can't stop thinking about it!!! Min rotiseis pos alla mas exoun steilei sto grafeio proskliseis gia to Fashion Week. 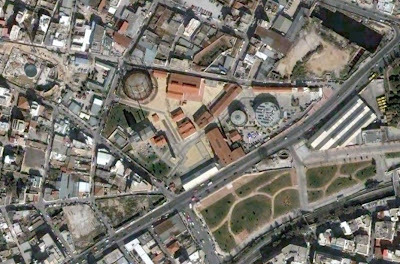 Kai exei kai atomiki prosklisi gia to defile tou Castelbajac. An boreso kai paro mia gia mena(einai gia dyo atoma)tha kateveis na pame?? ?